Farmers in sub-Saharan Africa lose up to 25% of their grain crops, largely due to poor storage and drying practices. This directly leads to reduced income for farmers. Post-harvest management such as specific harvesting, drying, and storing techniques can mitigate these agricultural losses. However, most farmers in Zambia have not been trained in post-harvest management, and in-person agricultural training in Zambia is costly because of low population density and a lack of strong cooperative networks. To reduce crop loss and increase farmer incomes, AGRA and WFP as the Farm to Market Alliance, will implement a farmer-led program to disseminate the best practices of post-harvest crop management. The goal of the training is for farmers to reduce crop loss and increase their incomes. The two-step training involves: 1) Project implementing partner staff (iDE) training lead farmers using a manual on post-harvest management best practices, and 2) lead farmers returning to train farmers in their locality. 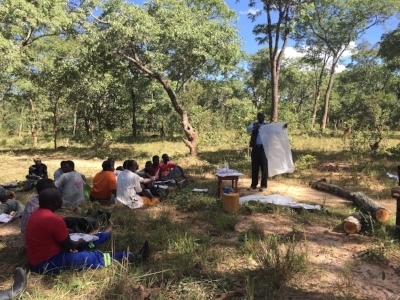 IDinsight’s process evaluation will provide recommendations to The Farm to Market Alliance and its implementing partners on program design and implementation, particularly the use of lead farmers to disseminate best practices to other farmers. IDinsight will conduct a process evaluation to identify strengths and weaknesses in the implementation of the two-step training. In particularly, during the second step, IDinsight will examine barriers to post-harvest knowledge dissemination, as well as retention and take-up of best practices. We will additionally do a basic costing model in order to determine cost per farmer reached.